Lets Quilt Something: Pilot Frixion Pens! 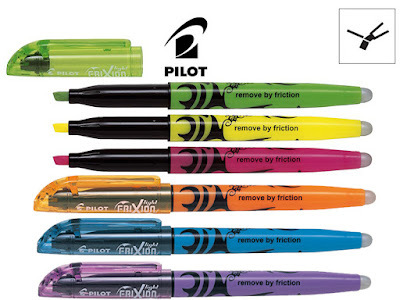 Ok so if you haven't seen the Pilot Frixion pens at your local quilt shop then you need to know about these. They have been out for several years. When I first heard about them I thought "Yeah,...Right...." but I ended up buying the highlighted colors and test them out. Well they truly work! I used to draw designs on quilts and even used them to mark diagonal lines on my piecing. But yesterday I noticed a true miracle! 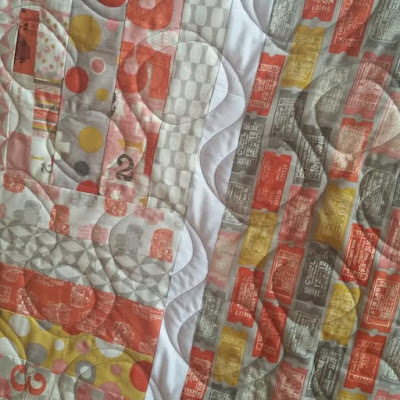 I was going threw my old finished quilt tops that haven't been quilted in awhile. I came across this one back in 2013! 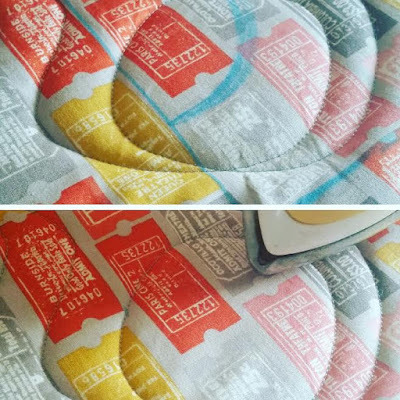 During that time this was my favorite fabric line from Moda, but once I opened it up I realized that I had marked it up with quilting ideas that I had wanted to do. I knew I had used the Frixion markers on it, but now the thought that was going threw my head was it's been 3 years, there is no way this is going to come off. I had even marked the white borders with a highlighter pink. So with very little confidence I just started quilting it and thought it would stay there forever and will just be apart of this quilt now. But after I finished quilting it, it was just wayyyy to beautiful. So I whipped out my iron and started to iron the marked up areas.......and.........It came OFF! I was so stunned and shocked that after 3 years of the marker settling in the cotton fabrics that it came off! Then I started ironing the white portions marked in pink and that came off too! There was no lighter or darker areas where the marker was. I have always like Frixion, but now I LOVE them! Here are some photos of the quilting and quilt where it shows it was marked and now gone. Dear Krystal- after doing extensive research on the frixion pens, I have decided against using them because the liquid from the pens really never leaves- it is always on the fabric. It doesn't really go away- just changes with the heat. It gets heat set into the fibers. Even though I like what they do, I don't want the chemicals from them remaining in the quilts. Not that my quilts are all that likely to worry about archival quality. MMM, we haven't heard of this happening from my local quilt shops but you have me worried again! Might need to start looking for other ideas. Thank YOU!